Use this sauce to toss with your favorite pasta and vegetables for a creamy primavera and garnish with your own homemade toasted pumpkin seeds (from the pumpkin you may be using for this recipe; but if not, then from the pumpkin that you are carving for Halloween). Top grilled tofu steaks or tempeh with this sauce and sprinkle some fresh parsley or cilantro for added color and a pop of flavor. Pour it in a gravy boat and serve over steamed veggies—such as broccoli and cauliflower. The color combination will be a feast for your eyes even before you delight in the flavor combination. Use it as the sauce for a baked casserole, whether it be a pasta and/or veggie casserole. A lasagna comes immediately to mind for me. Eliminate the coconut milk, add 8 ounces of vegan cream cheese, and you have a wonderful spread for crackers. Did I hear you say that you wanted a soup? No worries…just add a touch of vegan chicken-less broth and a smidge more coconut milk to the desired consistency. Still have a hankering for the taste reminiscent of a pumpkin pie? Ah, we have that covered as well. You can omit or lessen the amounts of the rosemary, sage, and thyme; substituting them with an additional ¼ teaspoon cinnamon, 1 teaspoon candied ginger or ½ teaspoon fresh grated ginger, 1/8 teaspoon ground nutmeg, 1/8 teaspoon ground allspice, and pinch of ground cloves. Are you drooling yet for the recipe? Trust me, this is a very easy recipe. During the time that you are baking the pumpkin, you can prepare all the other components, bringing them all together in the blender at the end. It’s well worth it, I assure you. If you are using a fresh pumpkin, which I would highly recommend, wash the outside of the pumpkin well with warm water and dry. Preheat oven to 400 degrees Fahrenheit. 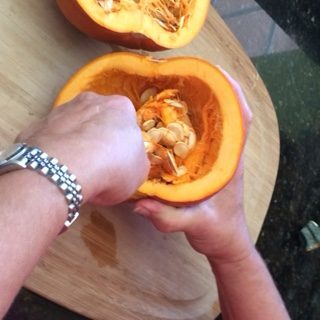 Cut pumpkin in half from top to bottom (please refer to picture). Scrape out the seeds, and set seeds aside. Place pumpkin on parchment paper lined cookie sheet, cut sides down (please refer to picture). Bake for 35 minutes, or until the top of the pumpkins begin to cave and are soft to the touch. Allow to cool. Once cool, measure out 2 cups of pumpkin (15-16 ounces), and place in blender. 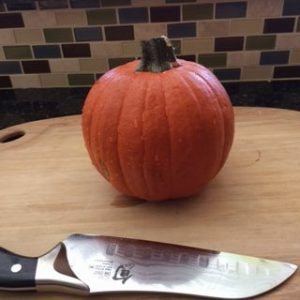 While pumpkin is baking proceed with these steps. Put the carrot, water, salt, pepper, rosemary, thyme, cinnamon, sage, red pepper flakes, and saffron into small saucepan. Bring to a boil, then simmer until carrot is tender and liquid is reduced in half. Set aside to cool slightly. Saute the onions and garlic in the olive oil or Earth Balance until translucent and tender, but do not caramelize. Add the pureed tomatoes to the onion/garlic mixture and cook for 5 minutes. Set aside to cool slightly. 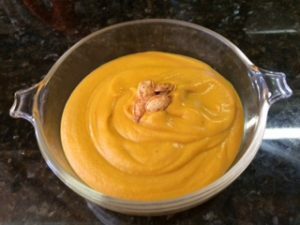 To the blender, add the pumpkin puree, carrot mixture, tomato mixture, coconut milk, agave, and nutritional yeast. Blend until combined. Yield: Makes approximately 4 cups of sauce. 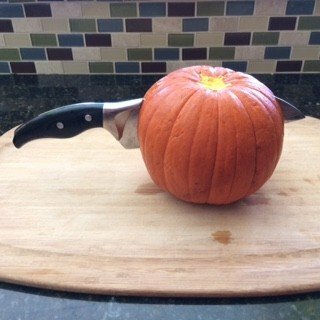 Oh, but we are not done…..you did remember to set aside those pumpkin seeds, I hope. Separate them from the stringy insides and wash the seeds well. Dry them in a clean kitchen towel. In a bowl, toss them with a small amount of oil, just enough to coat them but not leave a puddle at the bottle of the bowl. Here’s where the fun begins. You can season them however you’d like. 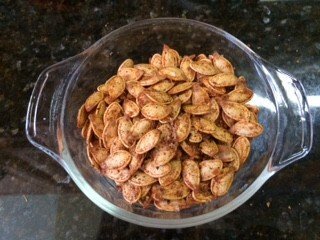 For this blog, I tossed them with sea salt, garlic powder, onion powder, lots of smoked paprika, crushed dried thyme and oregano. Heat a skillet to medium high. 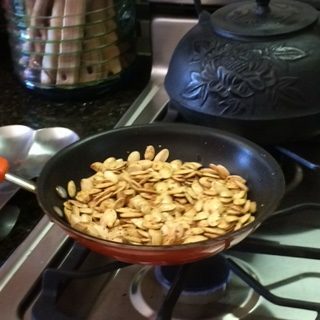 When it is hot, toss the seeds in the pan, keeping them moving so they and the spices don’t burn yet the seeds cook and get the yummy crispiness. You will know when they are done because they will no longer be glistening; and when you toss them, they will begin to sound crunchy and almost hollow. Allow them cool on a cookie sheet spread out so they will retain their crispiness.